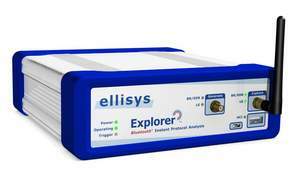 GENEVA--(Marketwire - Feb 20, 2013) - Ellisys, a worldwide leader in protocol test and analysis solutions, today announced a major update to its highly acclaimed, industry-leading all-in-one Bluetooth® protocol analyzer system, the Bluetooth Explorer™ 400 (BEX400). Packed with a myriad of new features, the Ellisys sniffer is the Swiss-Army knife for any engineer involved with Bluetooth technology. "We are proud that our Bluetooth Explorer 400 protocol analyzer is the most advanced analyzer ever built for this industry," stated Mario Pasquali, Ellisys president and CEO. "This new release brings incredibly useful new features such as spectrum display, HCI logging, logic analysis, integrated audio debugging and support for Audio I2S as well as WCI-2. And as an additional achievement, our sniffer already supports the major features of Bluetooth 4.1, including Secure Connection and Connectionless Broadcast." Thanks to its revolutionary and proprietary whole-band Digital Radio, the highly extensible Ellisys BEX400 has been updated to support the upcoming Bluetooth 4.1 standard with just a simple software update, and importantly, no need for an expensive hardware upgrade. Best of all, this update is free of charge for Ellisys customers. "Test and characterization of new Bluetooth silicon and end-products is a comprehensive process requiring a diverse set of engineering expertise and an array of specialized, analytical tools," said Muthu Kumar, Wireless Firmware Engineer, Intel Corporation. "The Ellisys Bluetooth Explorer plays an important role in this process by delivering a clear and complete understanding of the behavior of the ever-evolving Bluetooth technology from both hardware and software perspectives, all while providing exceptional ease of use." 2.4 GHz spectrum display, to visualize the impact of interferers on Bluetooth devices. Concurrent HCI capture, to complement wireless capture with USB, UART and SPI HCI information. Integrated audio analysis, to play back captured audio streams in sync with underlying traffic. Logic analysis, to display any digital signal in correlation with captured traffic. "The new advanced features provided by Ellisys provide our teams with tools that substantially increase visibility into the workings of Bluetooth technology," said Miles Louis Smith, Senior R&D Engineer, Test Group, Nordic Semiconductor. "We use the sniffer to diagnose complex timing issues that other sniffers might not be able to capture. Due to the unique radio architecture of the Ellisys sniffer we can capture all packets regardless of the timing. The reconfigurable hardware is very flexible, and the Ellisys team provides great support to help us get products to market sooner." These unique new features are part of the new PRO Edition. Existing customers can upgrade their BEX400 unit to the PRO Edition remotely by running a licensing upgrade application. The upgrade pricing is defined as the difference between the Standard and the PRO Editions. For pricing and other details on this offer, please contact Ellisys at sales@ellisys.com. For more information, including software downloads, please contact sales@ellisys.com. Bluetooth wireless technology is the global short-range wireless standard for personal connectivity of a broad range of electronic devices. More information is available on www.bluetooth.com. Ellisys, the Ellisys logo, Better Analysis, Ellisys Bluetooth Explorer, and Rainbow are trademarks of Ellisys, and may be registered in some jurisdictions. All other trademarks, product and company names are the property of their respective owners.